The British Archaeological Association’s 2013 conference was devoted to the study of Westminster Abbey and the Palace of Westminster. It also embraced Westminster School, which was founded at the Reformation in the Abbey precinct. Collectively, these institutions occupy a remarkable assemblage of medieval and later buildings, most of which are well documented. Although the Association had held a conference at Westminster in 1902, this was the first time that the internationally important complex of historic buildings was examined holistically, and the papers published here cover a wide range of subject matter. Westminster came into existence in the later Anglo-Saxon period, and by the mid-11th century, when Edward the Confessor’s great new abbey was built, it was a major royal centre two miles south-west of the City of London. 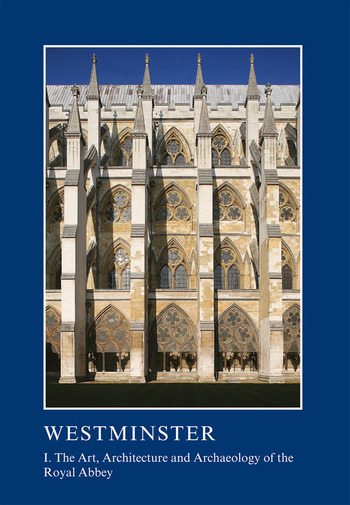 Within a century or so, it had become the principal seat of government in England, and this series of twenty-eight papers covers new research on the topography, buildings, art-history, architecture and archaeology of Westminster’s two great establishments — Abbey and Palace. Part I begins with studies of the topography of the area, an account of its Roman-period finds and an historiographical overview of the archaeology of the Abbey. Edward the Confessor’s enigmatic church plan is discussed and the evidence for later Romanesque structures is assembled for the first time. Five papers examine aspects of Henry III’s vast new Abbey church and its decoration. A further four cover aspects of the later medieval period, coronation, and Sir George Gilbert Scott’s impact as the Abbey’s greatest Surveyor of the Fabric. A pair of papers examines the development of the northern precinct of the Abbey, around St Margaret’s Church, and the remarkable buildings of Westminster School, created within the remains of the monastery in the 17th and 18th centuries. Part II part deals with the Palace of Westminster and its wider topography between the late 11th century and the devastating fire of 1834 that largely destroyed the medieval palace. William Rufus’s enormous hall and its famous roofs are completely reassessed, and comparisons discussed between this structure and the great hall at Caen. Other essays reconsider Henry III’s palace, St Stephen’s chapel, the king’s great chamber (the ‘Painted Chamber’) and the enigmatic Jewel Tower. The final papers examine the meeting places of Parliament and the living accommodation of the MPs who attended it, the topography of the Palace between the Reformation and the fire of 1834, and the building of the New Palace which is better known today as the Houses of Parliament.